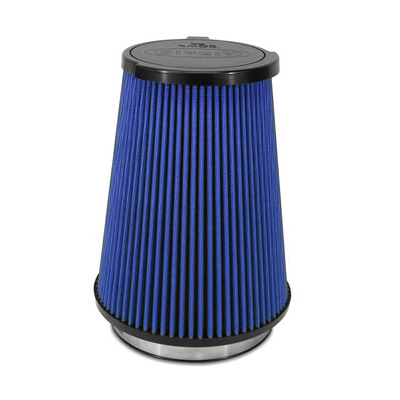 * Blue Filter Element These Airaid SynthaFlow air filters feature multiple layers of cotton gauze combined with their unique synthetic materials technology, resulting in a superior filtration system. The SynthaFlow technology provides maximized filtration efficiency without sacrificing airflow. That translates into more horsepower, torque, and increased MPG for your vehicle. Airaid SynthaFlow air filters are washable, reusable, and will filter out the smallest dirt particles that standard cotton gauze filters can't capture. No one else gives you the bold clean styling of our Aftermarket Dress Ups, Suspension and Performance Parts for your American Muscle Car like UPR Products! Fits these Vehicles: 2010 2011 2012 2013 GT500 5.4L 5.8L 330 V8 Mustang Roush & Saleen Vehicles. Made in the USA!